TRUMP GETS HIS WALL………. OBAMA GETS HIS POLICE STATE!!! NB Commentary: This is so fucked! And Obama thought he was hated???? Donald Trump’s transition from a flashy businessman and reality TV star to the President of the United States is keeping the security services busy. A no-fly zone was imposed over his home and workplace, Trump Tower, on Fifth Avenue in New York on November 9. The Federal Aviation Administration edict bans any aircraft in a two mile radius within 3,000ft of the 58-story building, which was the setting of the NBC television show The Apprentice and is not only Trump’s main residence but is also a tourist hotspot. Military, police emergency and secret service flights are exempt from the ban. Mashable reports that the change could cause flight delays out of LaGuardia Airport. Flights are also limited over Vice President Mike Pence’s Indianapolis home. The no-fly zone will be in play until Trump’s inauguration on Friday 20 January, 2017, when he will move into the White House. Meanwhile, on the ground, police officers have helped to install concrete barriers around the Tower. 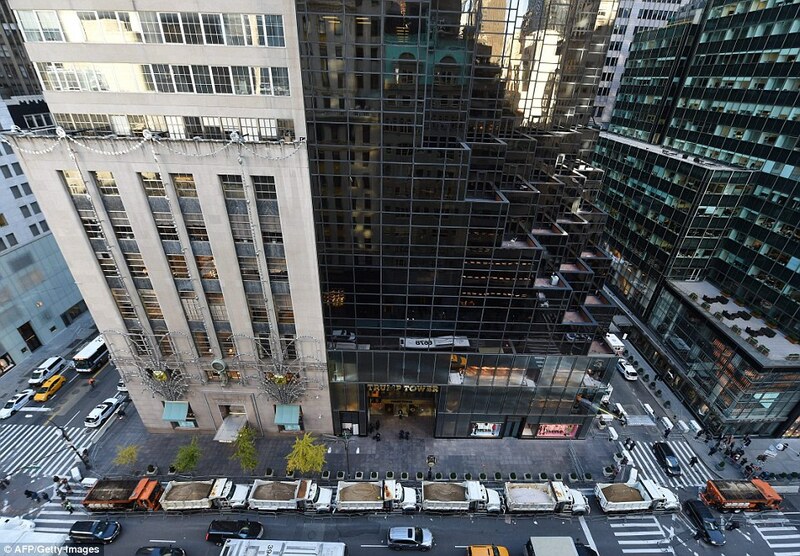 A row of sanitation trucks filled with sand have been acting as barricades along Fifth Avenue between 56th and 57th streets since Monday in order to protect the tower against car bombs. Sources said one lane of traffic that passes the Tower is expected to remain closed to prevent car bomb attacks. An NYPD checkpoint is also in operation outside the building while 56th street between Fifth and Madison is closed to traffic. On Thursday, heavily-armed officers could be seen around the president-elect’s home while Trump himself visited the White House. Trump and Melania, departed from LaGuardia airport in New York at 9.36am on his personal aircraft and arrived at Ronald Reagan National Airport just after 10.30am. Following the meeting, Obama said that he had an ‘excellent conversation’ with Trump. Trump’s son-in-law, Jared Kushner, owner of the New York Observer and a senior adviser to the president-elect’s campaign, was also in tow. People who work and live inside Trump Tower will also now be vetted by the Secret Service, the New York Daily News reports. And elevator routes will also be altered to stop people accessing Trump’s personal floors. ‘Obviously, Trump Tower is not like a house in the suburbs or the country. It’s a tourist location, with businesses and apartments inside, people coming in and out at all hours,’ a source told the New York Daily News. The glass building is one of New York’s most visited attractions since its completion in 1983. If Hillary Clinton had won the election, these additional security measures would not have been needed as her Chappaqua home is already deemed safe from when it acted as a presidential home for husband Bill. Trump first received a Secret Service detail after requesting one in November 2015. Clinton already had protection because of her status as a former first lady. When Trump and his family move into The White House in January, 10-year-old Barron Trump will be the youngest presidential son to reside in the executive mansion since John F. Kennedy, Jr. The White House has been home to only presidential daughters since JFK, Jr., whose father was assassinated just before his 3rd birthday in 1963. Kennedy’s son broke a long drought of boys living in The White House. He was the first since Quentin and Archie Roosevelt lived there beginning in 1901. Outside Trump Tower on Thursday, protesters gathered with signs reading ‘Dump Trump’. At least 30 people were arrested when cops cracked down on twin demonstrations in Columbus Circle and at Trump Tower. It wasn’t just New York that saw violence break out overnight. Tens of thousands of people across the country marched against the President-elect before angry mobs attacked police, started fires and shut down highways. The streets of downtown Oakland in California were choked with smoke Thursday as police launched tear gas and protesters lit fires, in what became by some distance the most violent of the many protests. More than 6,000 protesters were seen on the streets of Oakland with an initially peaceful march down a cop-lined street turning nasty after some protesters threw bottles at officers and torched a police car. An office block was also attacked, daubed with ‘f*** Trump’ and ‘kill Trump’ graffiti and then set alight. And thousands more filled streets in Los Angeles before taking over the 110 Freeway while other protesters gathered outside City Hall, lighting fires and waving Trump heads on sticks. There were 14 arrests. Trump’s poll-defying win has sparked a wave of similar rallies in Chicago, Illinois; Portland, Oregon; and San Francisco, California, among many others. Outside the White House, a candlelit vigil was being held in protest against Mr Trump’s inflammatory and divisive brand of politics. But even peaceful protests in that city went awry, with at least one protester being bundled into the back of a van by the Secret Service. In another step towards Trump taking office, his transition team has launched a new website and Twitter account for him. Visitors to greatagain.gov can find information on Trump’s polices as well as biographical information about the Republican. The website also includes a notice that it’s looking to fill 4,000 slots for presidential appointees, but doesn’t have instructions on how to apply for positions. New Jersey Gov. Chris Christie is leading Trump’s transition team.